A paper backed sheet of solid heatactivated adhesive. It uses a low temperature and short pressing time so a wider range of materials can be bonded. No seam or pressing cloth needed. 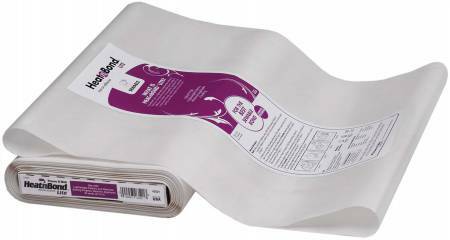 HeatnBond Lite can be easily sewn through, making it ideal for appliques, quilts and other sewable lightweight craft projects. Machine washable after stitching. Freight Intensive Freight intensive items are nonreturnable. Billable transportation charges for freight intensive items will be the greater of the dimensional weight compared to the actual weight. In addition to transportation charges, freight carriers may assess an additional oversize charge per package.